The Electronic Arts campus was almost like a college campus, including a big grass field in the center of all of the buildings. One building was a gym that featured a sauna and a massage room. This building also housed the basketball courts that real-life NBA players play on, which gets translated into the game. That building also included one of the two EA cafeterias and a martial arts room. 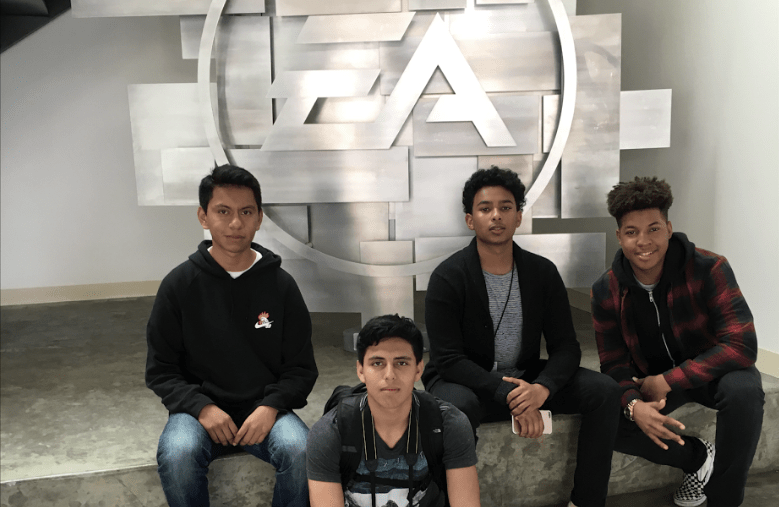 Electronic Arts is a perfect example of a company in the Bay Area that students would want to work at. It enables people with the dream of making video games to have the opportunity to do something that could benefit both their lives and their society. Working at EA combines the core skills of tech skills, communication skills, organization ability, management and problem solving. To get personal insight on how these skills can allow gamers to contribute not only to the company they’re working for but also to their community, we interviewed students from the Video Game Club at Summit Preparatory Charter High School about what they thought of tech companies in the Bay. The questions we asked the students were not only about contributing to the community, but also about what steps they are taking to prepare themselves to work in a company like EA. “You need to be creative and good with teamwork,” Ramirez said. That truth is shown in many ways at EA and also in other tech companies, as confirmed by Foster. Call said, “You will need skills of designing or like stories – like in some types of games you need a story, and, of course, every game has a main character.” This shows how the act of using imagination and creativity is to your advantage when working at these big tech companies. Something as simple as the plot of a story can contribute so much to the company. Having a lot of creativity can bring the company to a brighter future. The tech companies in the Bay Area have made an extravagant impact on the community. Tesla, YouTube, Facebook, Google and EA all heavily contribute to the community. These companies bring joy as well as jobs.